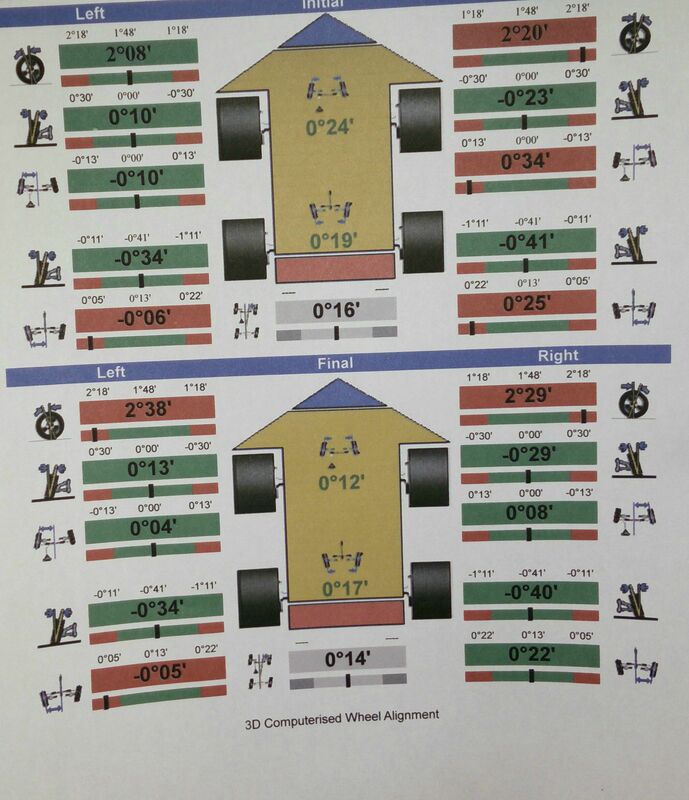 I got my front car wheels aligned today but I don't really now enough of the procedure and what the results mean. So I've uploaded an image for second opinions to see if it was done correctly. Now of course I know the general consensus is that if it's highlighted in red it hasn't been done properly. But is this the case? Is the caster angle (first red bars 2°38'/2°29') meant to be in red i.e. positive? The top diagram is the initial alignment and the bottom is the final product. Not the graphics I'm used to with another brand of machine and do not own one, contract out but there. Red is out of spec and green is within. Final is what it could be adjusted to and can't always get some spot on. This was 4 wheel w thrust angle alignment. It couldn't be brought to all green and what did the tech say about that? It might not be able to with caster get any closer without more or extensive work. What is this vehicle? Caster is not a wearing angle but will pull towards the more negative and done on purpose for some who complain with heavily crested roads to compensate. Basically I'm reading that "tow" - a wearing angle was brought into spec for front but not for rear. Arrr - one adjusted angle will effect another and for now it looks better but would like to hear what tech said on the specific vehicle why it couldn't be all in spec with final results - some not possible depending but should be informed. Ask tech what it would take to achieve all green within spec results for that vehicle. Some would take bending or shims if possible at all without wild antics. What is the year, make, model, and engine size of your vehicle? Did you ask the tech about the print out? If it is off, it is off in minutes not degrees which is a very fine adjustment that might not be critical. Caster and camber on some vehicles isn't adjustable. If we knew the vehicle and it is sold here in the states, could give you the specifications for it. It's a Hyundai Accent 2005 model. Silver, GSI, 5-door hatchback.